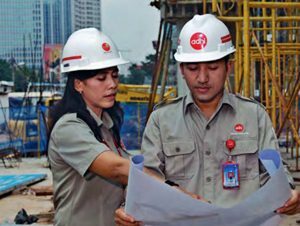 PT Adhi Karya (Persero) Tbk – Adhi Karya (IDX : ADHI) or referred to as “ADHI” is among the largest Indonesian state-owned construction companies. As a state-owned company, ADHI is majority owned by the Government of Indonesia. At present, ADHI is 51% owned by the Government of Indonesia and 49% by general public. ADHI’s scope of business comprise of Construction, management consultation and industrial engineering (Engineering, Procurement, Construction/EPC), Infrastrcuture Investment, Property Hotel and Real Estate. Headquartered in Jakarta, PT Adhi Karya (Persero) Tbk now has 5 directly-owned subsidiaries, namely PT Adhi Persada Properti, PT Adhi Persada Realti, Adhi Multipower Pte Ltd, PT Adhi Persada Gedung and PT Adhi Persada Beton. ADHI’s head office is located at Jl Pasar Minggu KM 18 Jakarta. In term of financial performance, ADHI is running well in the third quarter of 2015 (3Q15, ended in 30 September 2015). According to ADHI’s Financial Report 3Q15 as cited by JobsCDC.com, the Company managed to record revenue of Rp 5,415.85 billion in 3Q15. This reflected an 4.34% increase from Rp 5,190.57 billion in the same period at previous year (3Q14). Total profit for the period grew considerably to Rp 137.90billion, from Rp 102.05 billion in the previous year. Able to perform material testing lab / site. Operating knowledge of lab tools, sand cone, hammer test, etc. Able to create labratory result reports. Able to coordinate and communicate with the labor relations (external and internal). Have a good knowledge and strong understanding about the drawings and the scope of work in the field under the contract. Able to create jobs hospitalization. Operating knowledge of measuring instruments TS, Theodolites, Waterpass, etc. Able to process the data measuring to the data prepared in pictures. Able to create measuring reports. Operating knowledge of AutoCAD, 2D and 3D. Mastering the image control administration. Mastering calculations in the scope of contract / image. Chronological changes in the scope of work. Minimum Diploma (D3) Civil Engineering. Able to create th report. The candidate with prior experience minimum of 2 years in the related field is preferred. Bachelor Degree (S1) Environmental Engineering. Bachelor Degree or equivalent (S1/D4) K3. Started from planning, Operation, implementation and monitoring and reporting. Able to create or identify risk. Required experience for minimum 2 years in construction companies. Minimum Bachelor Degree (S1) Civil Engineering, Law.